Two young Bulgarian violinists won prizes in the fourth edition of the International Competition “Vasco Abadjiev” (November 23-26), organized by Club UNESCO Leonardo da Vinci Sofia. They are 16 year-old Alexander Zayranov and Kristina Georgieva. A record number of participants – 24 from 15 countries, fiercely competed against each other in the National School of Music “Lyubomir Pipkov“. Finally first place was shared between the Japanese girls Maine Nishiyama and Yoshi Okura who showed an exceptional virtuosity. They each got 1000 Euro from the 3300 Euro prize fund provided by the leading bank of the competition Unicredit Bulbank. The checks and the prizes were handed to them by Dilyana Stoyanova, Event and Sponsorship Manager at the bank. Second prize was also awarded to two violinists – Clemence de Forceville (France) and Yukari Ohno (Japan). The talented violinist from Varna Alexander Zayranov, Lisa-Maria Sekine (Austria) and the Japanese Megumi Kasugai got third prize. Kristina Georgieva, a graduate student of the National School of Music, who currently studies in Belgium with the famous Professor Leonid Kerbel, took the Young Talent Award. Clemence de Forceville won the special award „Stefan Balkanski“ provided by Mrs Antonia Lavine. The jury pronounced the 26-year-old French girl to be „a completed violinist with remarkable artistry“. For best performance of Paganini Caprice was awarded Yukari Ohno, who took the prize of the string producer Larsen Strings. All the winners were greatly applauded at the gala concert, which was performed under the accompaniment of the Academic Symphony Orchestra of the National Academy of Music „Prof. Pancho Vladigerov“ conducted by Prof. Ivaylo Krinchev. “The level this year was very high, that’s why the prizes were shared. We are extremely glad that there are Bulgarian performers who were awarded. For the first time in the competition our school has been so successfully represented. Our authority increases and people will spread the glory of both Bulgaria and Vasco Abadjiev around the world”, commented the chairman of the jury Prof. Angel Stankov. Other members of the jury were Prof. Yosif Radionov, Prof. Nedyalcho Todorov, Prof. Elisabeth Kropfitsch (Austria), Prof. Habib Kayaleh (Switzerland) and Dr. Laurits Larsen from Denmark. 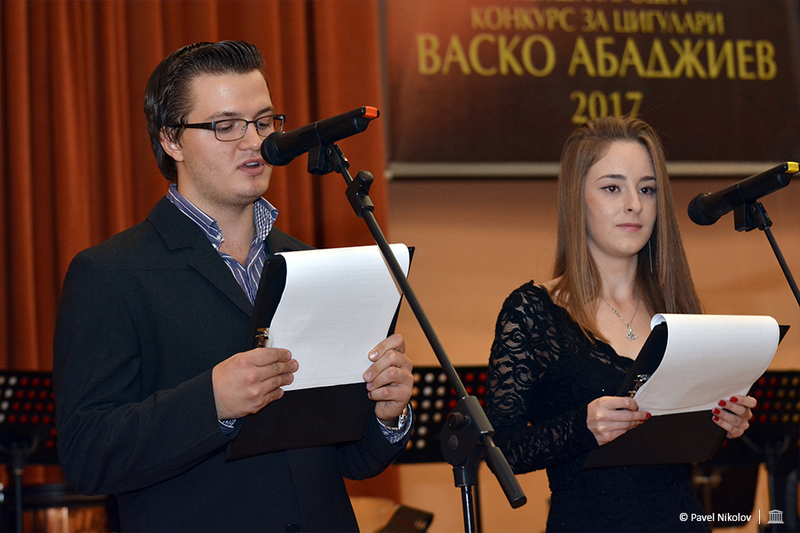 The project is funded by Sofia Municipality “Culture” Program for 2017. The goal of the competition, which is held every two years, is to revive the national and international memory of the great violinist Vasco Abadjiev (1926-1978) and to encourage the development of the young violin talents – the heirs of the spirit of Abadjiev.